I made this for the CAS-ual Friday challenge. Three shades of pink, on Kraft cardstock. Tricky card to execute and I still can't tell what I think of it. But fun to try something new. I hand-drew the flowers, then traced them with a thin line of glue to hold the thread in place. I have an idea for a card similar to this with multicoloured braided threads, I'm looking forward to trying that. Besides fun to look at this is also fabulous. I love love love how this turned out. Wow! Brilliant use of floss! Love all of the pink. 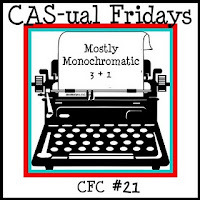 Thank you so much for playing along at CAS-ual Fridays this week. Ooo these floss flowers are awesome in this trio of pink colors! They look fab against the kraft background:) Thanks for playing this week at CAS-ual Fridays! i like to make this for my nephew . i the design and material i will add blue color also.